Oct. 21, 2017 9:00 p.m. 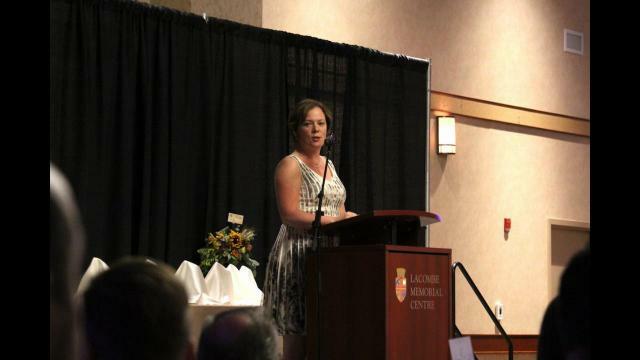 The Lacombe and District Chamber of Commerce Awards, which took place Oct. 21st at the Lacombe Memorial Centre, saw almost 200 people come out to celebrate local business. “We had a nice big crowd tonight, almost 200 people out to celebrate our Small and Large Business of the Year, our Non- Profit, Citizen, Lifetime, Farm Family and People’s Choice so it was a great evening of celebration of business achievements and individual achievements as well, really all benefiting our community as a whole,” said Monica Bartman, executive director with the Lacombe and District Chamber of Commerce. She said it’s nice as they have the business side of things, but they are able to focus on the community side of things as well, with the Citizen and the Lifetime Achievement award. “It’s interesting because the folks that are being recognized in those other categories often times are people that have owned businesses in the community and so much of our business community is how those community things happen,” she said, adding that it’s unique and nice to be able to focus on both sides. Taking home an award for Small Business of the Year was Red Hot Threads. “It just goes to show that people notice how hard we are working and that we are in the community. It’s not an easy job so it’s great to be recognized for the hard work we do,” said Owner Krystal Rundell. The Large Business of the Year award went to Lionel’s No Frills. Lionel’s wife accepted the award on behalf as he couldn’t be there. “He wants to really thank his staff, they are really the people that you see every day in the store. You all have a choice of where to shop, and thank you for choosing Lionel’s No Frills,” said Charmen Baron. The award for People’s Choice for Customer Service went to Scott Beauclair and Darryl Deutsch of Napa Auto Parts. “This is awesome, me and Darryl would both like to say thank-you and we’re both very happy that people appreciate the work that we do,” said Beauclair. Taking home the Not for Profit of the Year was Lacombe Athletic Park Association. The Citizen of the Year went to Ellen Corea, while the Lifetime Achievement went to Irene Prins. “I feel very honored to represent volunteers in Lacombe and area. I know this is a lifetime achievement. I started volunteering many, many years ago, probably before some of you were born and I have enjoyed every single one of those moments,” said Prins. Farm Family of the Year went to Ko Bruning and family.